In November, Wendell and I were in Colorado to spend Thanksgiving with our daughter and family. Her son and I prepared the turkey as our Martha is a vegetarian – we baked the stuffing separately, of course! We had a good visit, which included checking out cats at a local animal shelter. Their much beloved cat had recently died. But for Wendell, the big deal was a car museum in Denver he had read about in the Plymouth Bulletin, the Forney Museum. The article was about a 1932 Plymouth PB roadster and its radiator cap which had been stolen; unfortunately accessories are frequently stolen from displayed cars, the article pointed out. Wendell had shown the article to the person issuing our tickets when we reached the museum. She made a copy of it, as they had not seen it. After a thorough tour of the museum, we failed to find that car. We were about to explore a recently restored railroad train, complete with a dining car featuring white tablecloths and fancy place settings, an elaborate sleeper car and a huge steam locomotive which had been restored by the museum. Then a volunteer guide asked if we would like to hear a talk about the train car, because she was bored and things were slow. She mentioned her own cars, which were stored in a museum warehouse, five, as I recall, and that she would get the key and show us through it. The Plymouth roadster was also there. The warehouse was filled (crammed) with vintage cars, pickups, motorcycles and an old airplane being worked on. Quite a few were owned by local people who needed a place to store their cars. We admired her cars, saw the Plymouth, and much to the joy of our grandson, Mustangs. This remarkable lady even had a drag racer and had drag raced since she was 19. She reminded us of our own VAE friend, Doris Bailey. Martha and I were almost “car’d” out, but the gift shop restored us. As we were leaving, we told our guide we would be sending Vermont maple syrup to her as she took us into the warehouse for a tour that usually required a much larger group. I realize that this “Softer Side” is a bit car heavy, but the Forney Museum is truly an impressive and interesting place. Look out, Nancy!!! Mechanical things need three things to work and work well. First, they need to be kept clean and dry, second they need to be properly lubricated and third, they need to be properly adjusted. This advise is especially true of wheel bearings. Oddly, one of the biggest problems with wheel bearings can be caused by OVER lubricating them. The term “packing” wheel bearings has more to do with the application of grease than the quantity of grease. To properly “pack” wheel bearings, the grease needs to be distributed thoroughly throughout the bearing assembly. The actual amount of grease needed is quite small. If too much grease is “packed” into the bearing and the cavity, this grease will be pushed out when the wheel spins, and could easily ruin the brake shoes. In addition, the wheel bearing could actually overheat. Repacking wheel bearings is an easy job, and should be part of the routine maintenance of the vehicle. Before you decide to re-pack wheel bearings, make sure you have new grease seals and fresh wheel bearing grease on hand. If you suspect the bearings may need to be replaced, make sure you have them too. Make sure you have the proper parts before disassembly. Several VAE members can tell the story of how I purchased a set of trailer bearings assuming they are all the same size-They are not. Long story short, there are two sizes, and they are only 1/16″ different. By the time I realized this, the auto parts stores were all closed, and we were at the side of the road with the wrong parts. Bad wheel bearings have several tell tale signs of failure. They often make a humming, growling sound at speed. When turned by hand, they often make a “gravely” sound. There should be no axial play in the hub. Front wheel bearings that have failed will make a different sound as the steering wheel is turned. Generally, if the bearing sound goes quieter when you turn the wheel to the left, it is the right bearing, and if it gets quieter when you turn to the right, then it is the left bearing. Oddly, a lot of newer cars do not have serviceable bearings, the entire hub needs to be replaced. I have noticed that these new hubs have almost no grease in them. To repack a wheel bearing, first the spindle or axle nut needs to be removed. Often a puller will be needed to remove the hub assembly. If the cones need to be removed, a press will come in handy for removal. The grease seals will almost certainly be destroyed upon removal. The bearings and the hub need to be cleaned and dried. Kerosene and a clean paint brush work well to clean old wheel bearing grease. Once washed clean of grease, all traces of the solvent need to be removed. Soap and hot water work well for a final clean. Traces of solvent will destroy the wheel bearing grease. Once the bearings are clean and dry, they are ready for an inspection and greasing. Inspect the bearings carefully, looks for pits, scoring, rough spots or signs of overheating. Spin the bearing and listen for the tel-tale “gravely” sound. Feel the bearing as it rotates and feel for any binding or rough rotation. If the bearing is reusable, it is time to pack and reassemble. Cleanliness is super important. Wash your hands and dry well. Take a dab of grease and place it in the palm of your hand. Push the grease through the outer race toward the inner race, getting grease through the rollers or the balls of the bearing. Once all the voids of the bearing are full, rotate the race a bit to evenly distribute the grease. Alternatively, a zip loc bag can be used to force grease through a bearing, or you could also use a bearing packer. I still prefer to do this job by hand. Take your finger and put a smear of grease on the outer cone. Repeat this procedure for the second bearing in the hub. Make sure you put a thin smear of grease on the lip of the new seal. The seal goes with the flat side on the outside, and the spring on the inside of the lip should face in. I use a scrap piece of 2 by 4 lumber and a mallet to tap the new seal in place. I have an oil seal installation tool, but I find the 2 by 4 works better. Reassemble the bearing/hub assembly. Do not fill the voids of the hub with extra grease. Once the assembly is together, tighten the spindle or axle nut. If there is a torque specification, torque to spec. If not, and it is a tapered roller bearing spindle, I tighten the nut until the bearing just starts to bind, then back off until I can install a cotter pin. You want to find the “sweet spot” where the wheel is loose, and also not binding at all. Too tight, or too loose and the bearing will soon fail. Feel the hub assembly and check for wob-ble in the bearing. Put the wheel back on and spin it a few times. Check for free noise free rotation, then check for wobble again. Place the dust cover on, and you are all set. If done properly, the freshly packed wheel bearing should last a long, long time. The car is a 1930 Hupmobile Model S sedan with a 210cu-in Century 6 engine. The sales ads that year stated 70 horse power 70 miles per hour. I purchased the car from a would be restorer in Pointe Claire, Quebec, in pieces, in 1980. A post card in the car stated it had originally been owned by the Graham family in Hawksbury, Ontario. I believe I am the third owner. Preservation work was slow as I had no idea of what a Hupmobile was. A chance meeting with Pevril Peake and his Hupp allowed me to learn the details of the car. Pevril’s Hupp had wire wheels but he wanted solid disc wheels like mine as he was tired of cleaning the spokes on his. The first trip was to Stowe in 1984. That was one adventure I wont forget. We travelled from Pointe Claire Quebec a distance of about 150 miles. Every 5 miles or so the car would backfire and die. We made it to Stowe and even did the parade or at least we made it past the reviewing stand. By now we were keeping the mosquitoes away with the smoke. The car died again just over the bridge on Mountain road. It would not climb the hill. I removed a spark plug and found it totally carboned over. After cleaning the plugs we made it back to the Scandinavian Motel where we were staying. Sunday was spent under the hood with lots of help and advice from many car guys. Final conclusion; the float in the vacuum tank leaked and allowed raw gas directly into the manifold. A few days in Bristol and the help of Pev’s friend Karl gave the car new life. We drove home at a nice steady 45 to 50 mph. We attended several more Stowe meets with the car until I was transferred to Calgary Alberta in 1990. The car has since given me a few more headaches since arriving here. The higher altitude may be a factor. We are at 3000 feet ASL. In any event the car has been responsible for the opportunity to meet a lot of very wonderful people in the car hobby. I look forward to the next visit to Stowe. I definitely miss the show and flea market. I am still trying to find anything like it here. Editor’s notes… Robert Craig Hupp, a former employee of Oldsmobile and Ford, found-ed the company with his brother Louis Gorham Hupp in 1908. Production began in 1909. Following disagreements with his financial backers Robert Hupp sold his stock in the Hupp Motor Car Company and established the short-lived RCH Automobile Company, later the Hupp-Yeats Electric Car Company. In 1912, Hupp would be one of two automakers pioneering the use of all-steel bodies. Hupp Motor Company continued to grow after its founder left. A new plant was purchased in 1924 as Hupp competed strongly against Ford and Chevrolet. DuBois Young became company president in 1924 moving up from vice-president of manufacturing. By 1928 sales had reached over 65,000 units. To increase production and handle the growth in sales, Hupp purchased the Chandler-Cleveland Motors Corporation (Chandler Motor Car) for its manufacturing facilities. Sales and production began to fall even before the onset of the depression in 1930. A strategy to make the Hupmobile a larger, more expensive car began with the 1925 introduction of an 8-cylinder model, followed by the discontinuance of the traditional 4-cylinder Hupmobile. While aiming for a seemingly more lucrative market segment, Hupp essentially turned its back on its established clientele. Unfortunately, the company made the same mistake that many other medium-priced carmakers were making at the same time. Namely, in an attempt to capture every possible sale, they offered many different models. With Hupmobile’s relatively low production volume, the result was that no model could be produced in sufficient quantity to keep manufacturing costs low enough to provide an operating profit. Hupp abandoned its more conservatively styled product line and turned to industrial designer Raymond Loewy to design its 1932 Hupp cyclefender, a flashy roadster that did well at the track, but sales continued to decline. 1934 saw the introduction of a striking restyle called the “Aerodynamic” by Loewy, as well as the lower-priced series 417-W using Murray-built slightly-modified Ford bodies. Despite technical innovations, squabbles among stockholders and an attempted hostile takeover in 1935 took their toll on the company. By 1936 the company was forced to sell some of its plants and assets and in 1937 Hupmobile suspended manufacturing. 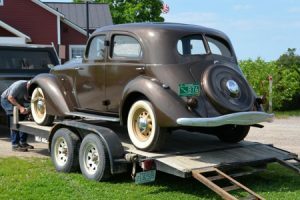 A new line of six- and eight-cylinder cars was fielded for 1938, but by this time Hupp had very few dealers, and sales were disappointingly low. Desperate for a return to market strength, Hupmobile acquired the production dies of the Gordon Buehrig designed Cord 810/812 from the defunct Cord Automobile Company in 1938. Hupmobile hoped that utilizing the striking Cord design in a lower-priced conventional car, called the Skylark, would return the company to financial health. Enthusiastic orders came in by the thousands, but production delays soured customer support. Lacking adequate production facilities, Hupmobile worked out a deal with the ailing Graham-Paige Motor Co. to share the Cord dies, which would be built at Graham’s facilities. The Graham edition, called the Hollywood, differed from the Skylark in only a few minor details. In 1939 the Hupmobile Skylark finally began delivery. Unfortunately, it had taken too many years to produce and most of the orders had been canceled. Production lasted only a couple of months, and only 319 Sky-larks were produced. Hupmobile ceased production in late summer. Graham-Paige suspended production shortly after the last Hupmobile rolled off the line. Robert C. Hupp, who had worked for Olds, Ford and Regal, introduced his own car in Detroit in 1909. Called the Model 20, it was quite a success in the lower price class. As a promotional stunt and right off the assembly line, November 10, 1910, a Hupmobile left on a 48,600 mile around the world trip to 26 different countries, returning on January 24, 1912. In the meantime, Robert Hupp left the company in September 1911 following a dispute within the company. As Ranson Eli Olds did, when he left Oldsmobile and established REO (his initials) Hupp established R.C.H. (his initials) Automobile Company, but was not very successful. Hupmobile did quite well through the teens and twenties with 1928 sales of 65,862. However, sales fell to 50,579 in 1929 (when over 100,000 was expected) and with the Great Depression Hupp was in trouble, as were many other automobile companies. But Hupmobile still had a couple of bright spots ahead, if not in sales and the bottom line, certainly in styling. In 1932 Hupp came out with their “form fitting” fenders (also referred to as the cycle-fendered Hupps) as well as chrome-plated wheel discs. This car was designed by industrial designer Raymond Loewy and was extremely handsome. Raymond Loewy is probably most famous for his design work for Studebaker. Beginning in 1938, he and his team designed several notable Studebakers including the 1953-54 Starlight Coupe and Starliner Hardtop, the 1955 Speedster and the Hawk models beginning in 1956. Later in 1963, Loewy was responsible for the design of the Studebaker Avanti. Also designed by Loewy were the Aerodynamic Hupmobiles introduced in 1934. In terms of design, these cars were several years ahead of the square, box-like designs of most four door sedans of the time. Hupmobile itself still produced these “square” models along with the sleek aerodynamic model. The Aerodynamic Model featured a fastback design that made the 4 door appear like a 2 door sedan with the spare tire and cover molded into the sloping trunk lid. Could this have been the inspiration for the continental kit of the 50’s? It had a split rear window, maybe the inspiration for the ’63 Corvette coupe. It had a 3-piece windshield, an early version of the wrap-around windshield of the 50’s. It also had built in headlights which, except for the Chrysler and Desoto “Airflows” and Pierce Arrow, other cars didn’t have until 1938-41. Cadillac was one that waited until 1941. 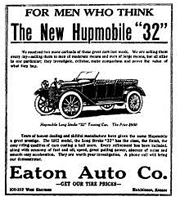 I believe one of the problems leading to the demise of Hupmobile was the expense required to develop all the models and body styles they offered. In 1932 there were 8 different models (two 6-cyl. and six 8-cyl.) featuring from 1 to 6 body styles for each model. In 1934 there were 7 models (four 6-cyl. and three 8-cyl.) with 2 to 6 body styles in each model. There were three 121″ wheel base 6 cyl. models in 1934: Series KK-421A (90 HP) with 6 different bodies; series K-421 (90 HP) with 4 bodies; series 421-J (93 HP) with 3 bodies. The car I have is a Series 421-J sedan. The original owner was a gentleman from West Townsend, Vermont. My dad tried to buy the car in the â€˜60s, but it wasn’t for sale. Some time later it was sold to Donald Miller of Miller Construction in Windsor, Vermont. My dad bought it from him and a friend, Milton Norris, restored it – probably in the early 70’s. Milton, had recently retired from one of the machine tool shops in Springfield and did an amateur restoration including mechanical work, body work (rust) and paint. Some of the chrome was replated, but the bumpers were simply painted silver. The interior is still original. We brought it to Derby Line in the late ’80s and used it for several years touring and going to shows in Sherbrooke, Que., Enosburg, Newport and other local events. It hasn’t been used for several years now but deserves to be back on the road again with a better paint job and chrome bumpers!! I’ve had comments on the car from: “that’s the ugliest car I’ve ever seen” to “Wow! What awesome styling”. I guess beauty is in the eye of the beholder. The design was deemed good enough to get our Hupp recognition for “Best Original Design” at the “Art of the Car” themed car show at Shelburne Museum in 2016. Good Job, Mr. Loewy! As for the fate of the Hupmobile, it was all downhill. 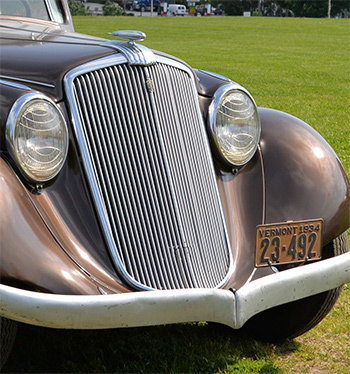 There was never a 1937 model introduced, but a few cars were built from left over 1936 parts. In 1938, for $45,000, Hupmobile purchased the dies, tools, etc. that were used for the defunct 810/812 Cord hoping this could be their salvation. The Franklin Company had sold about 43,000 cars by 1919 and had the process fairly well perfected by then. They were using 6 cylinder engines in 1906 for some of their models and by 1914 all Franklins had six cylinder engines. Managing the air flow was important in these air cooled vehicles and until 1922 all that was required was a fan between the engine and the transmission to help “pull” the air through. As the horse power increased they moved the fan to the front of the engine and continued to use the cylinder fins to force air down past the hot cylinders, this was called a “down-drafter”. As the 6 cylinder engine power grew, from 24 HP to over 100HP, the company changed again in 1930, to keeping the fan in the front but now forcing air “across” the engine thus calling it a side drafter. A much more efficient way to keep the engine cool. It appears George and Eva began a family tradition with the Franklin car. Over the years they had the 1919, a 1923 sedan and two 1929s sedans. One of those 29s later was reworked into a pickup truck which also sits in David’s garage. David’s dad, Richard, added a 1930 and 1931 sedan to the family Franklin history and then David took his turn when he was 15 years old, when he purchased a used 1930 sedan for $45.00. David also bought a ’31 roadster at one point bringing the count to eight Franklins. Richard was an engineer and loved to tweak things and make them better. While the 1919 was in his possession he added an electric fuel pump with a pressure regulator, to keep the carburetor from handling anything over one and a half pounds of fuel pressure. He also added a fuel pressure and a vacuum pressure gauge to the dash. The ignition switch has an extra position so when you engage the starter a second battery is wired in to have 12 volts. Once the engine is running, the switch is moved to the 6 volt position. It is probably not totally unusual for an automobile to be purchased new and be in a family for ninety eight years, but Wheel Tracks did not want to miss out telling this story. As you have read in our classifieds the 1919 is for sale. David and Cereta need to down-size and have decided to try to find a good home for the old girl, that still runs perfectly. The hope is that the car stays in the VAE family and will have many more stories to tell years from now. How many of you will be watching for those Rutland addresses the next time you go through. Please take a picture of what is there now and send them to Wheel Tracks. Mary Jane Dexter tells the story of going to Germany with her husband Bill to pick up their new, factory fresh, VW like it was yesterday. In fact the poppy-red VW Convertible Beetle is 50 years old now and still sits in Mary Jane’s garage. Ninety one years old Mary Jane said the Beetle heads to her Colorado nephew, Russell Dent, when she decides it needs a new owner. Asked about the process at the German factory when they arrived to take possession of the car and she said it took about 3 minutes and they were down the road with it. They had ordered and paid for it before they left their hometown in Rumson, New Jersey. They toured Germany, then dropped the car off in Belgium for a ship to take it across the Atlantic, the Dexters then picked the car up at the port of NJ. Mary Jane said they even have a name for the VW. During the German tour and the drive along the Rhine River they came upon a huge rock on the eastern river bank called the Lorelei and that name also became the name of their Beetle. I forgot to ask if it was because their VW resembled the rock and if it has to do more with the fabled feminine water spirit that comes from that same area. Another neat point was the fact that, at that time, convertible VWs were built for export only. I am sure the German tour resulted in some second looks as MJ and Bill motored the German highways. Mary Jane was the original “Badge Lady”. She and Bill belonged to a woody club and those members had name badges that identified their club affiliation. She thought that VAE members should also have their own unique name badge and took on the task of designing and getting badges for us. I’ve heard that if you attended a VAE function without your badge there was a 50 cent fine. I have three badges that I purchased through Mary Jane and I still forget mine. Good thing for me we no longer collect the fine. The year I was in charge of the appreciation dinner Mary Jane wrote all the name tags using her calligraphy pens. They were so elegant and appreciated. This from long time friend Jan Sander… Jan remembers a day at MJ’s home during a VAE gathering when Jan’s son David had brought his VW to the gathering. Jan said that for some reason she had tripped and fallen against David’s car. Jan still remembers MJ’s response to her irreverent VW collision. Mary Jane simply said “ Bad mommy… leave the car alone”. Yes, indeed, Bill Dexter was a Ford Man. From his first 1934 Ford Roadster with a rumble seat to the Model A’s and then to the Ford V8 Station Wagons, he has a lot of Fords. He Stayed with this model as it fit his needs of transportation of students to games and meetings, and for ski trips and camping. Then I came along with my penchant for “bugs”. Bill tried to show an interest in these cars and became fascinated when I acquired a poppy red VW convertible. He marveled at the ease with which it soared West Hill Road when snow was heavy on the road. Bill was interested! That summer, was planned as a trip to Europe and Bill thought it might pay us to purchase a VW overseas and use it for our transportation. So we took delivery of our 1965 Poppy Red convertible in Germany. This was our chance to break in the car in its own language! It was a blast. VW was then still making the convertibles for export only, so this vehicle which we named “Lorelei” received plenty of attention. Vas is los? She was a marvel in the mountains, speeding up the steepest of hills, passing the other cars, large and heavy, panting and steaming along the side of the road. We just zoomed along with a satisfied smile and a “Gruss Got”. We had our sleeping bags along with us to save overnight expenses. Two people in that little bug was a challenge. We tossed a coin to see who would get the back seat (preferable) or the front seat winding in around the gear shift, brakes and other protrusions. It went reasonably well except for one night, it rained. Bill forgot to bring in his boots! In the morning, he found the boots well filled with Black Forest water! We shipped Lorelei home and I drove her off the dock in New Jersey. She has been in many parades and shows and she knows her was around the Stowe Show field very well.